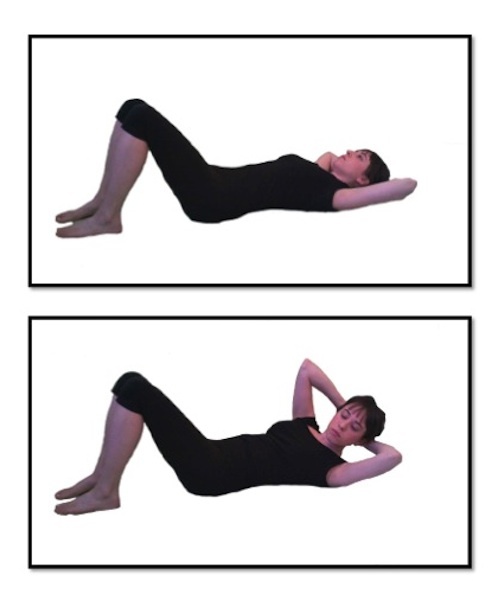 This exercise will continue increasing the abdominal connection as well as articulating the spine through rotation and flexion. To do this exercise you will need a mat. Start by lying on your back with your hands clasped at the base of your skull, your knees bent, and your feet flat on the mat. Inhale into the back of the ribcage and exhale as you begin reaching the right elbow, arm, and shoulder toward the lift hip, thigh, and knee. Inhale at the top and exhale as you lower your body back to the beginning position. Inhale into the back of the ribs and exhale as you repeat this movement on the opposite side. Repeat 5-10 times alternating sides. This is exercise is so much more than reaching your elbow to the opposite knee. If we reach just the elbow to the opposite knee, then we are not integrating the core into the movement. This exercise is about lifting one side of the upper body and moving it to the opposite side of the lower body. The breath is key in this exercise, be sure that you are inhaling into the back of your ribcage and exhaling completely as you do this exercise.